Home/Featured Items/IMHOF MODEL 75/845 NIGHT CLOCK. This unusual piece is an Imhof model 75/845 8 day night clock modelled on earlier Victorian candle lit types of similar shape. 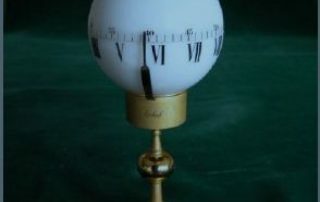 The movement is horizontally housed in the split glass sphere, the hour wheel rotating the lower hour hemisphere and the minute wheel driving the upper minute hemisphere. I am unsure of the calibre of the movement, which is wound from the cylinder under the sphere. The time is set by rotating the hemispheres and is indicated by alignment of the hours and the minutes with a vertical indicator.